The Syrian regime killed at least 45 people and sickened hundreds of others in a chemical weapons attack on Douma, Syria, April 7, and on April 13, U.S., British and French service members launched attacks that severely degraded the Syrian chemical arsenal and sent a message to Syrian leader Bashir Assad to stop using chemical weapons against his own people. 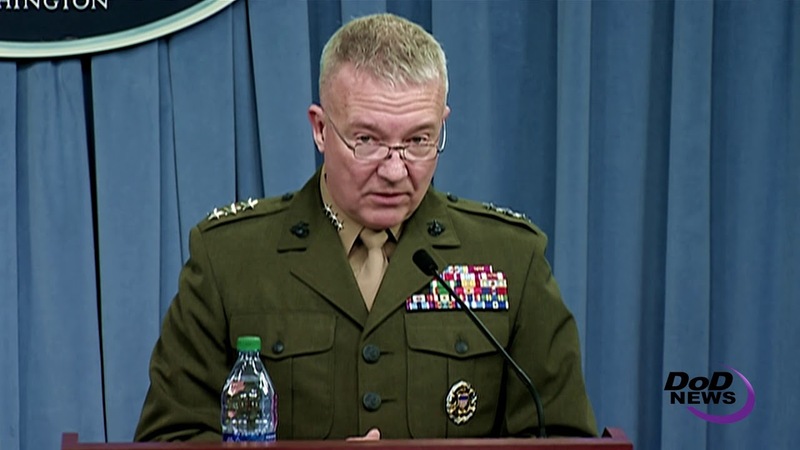 Chief Pentagon spokesperson Dana W. White and Marine Corps Lt. Gen. Kenneth F. McKenzie Jr., director of the Joint Staff, discuss operations in Syria during a news briefing at the Pentagon, April 14, 2018. DoD photo by Air Force Tech. Sgt. 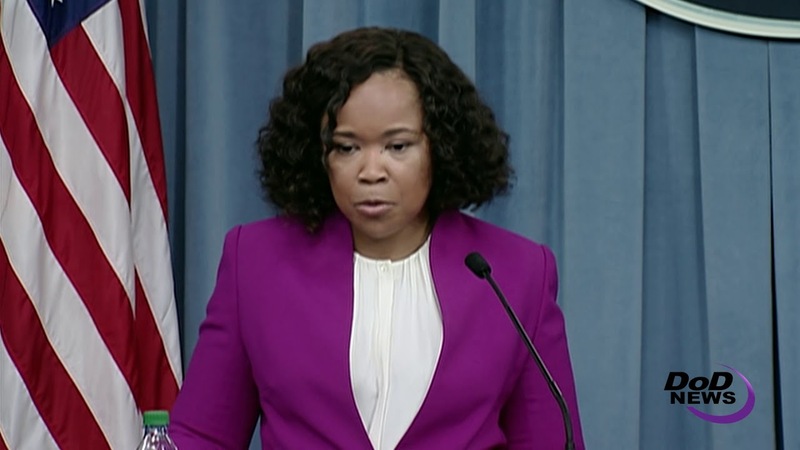 Vernon Young Jr.
Chief Pentagon spokesperson Dana W. White and Marine Corps Lt. Gen. Kenneth F. McKenzie, the Joint Staff director, briefed the press today from the Pentagon on the operation saying it was successful and that there were no allied casualties. White said the attack on innocent civilians in Douma “demanded a response,” and the allies targeted the Syrian regime’s chemical weapons infrastructure. “We launched these strikes to limit Syria’s ability to use chemical weapons in the future,” she said. The operation was carefully orchestrated and methodically planned to lessen chances of civilian casualties, the spokesperson said. The missiles hit targets during the Syrian pre-dawn hours, and planners, weaponeers and aircrew were careful to ensure little collateral damage. “We successfully hit every target,” White said. Missiles hit three distinct military chemical weapons targets. 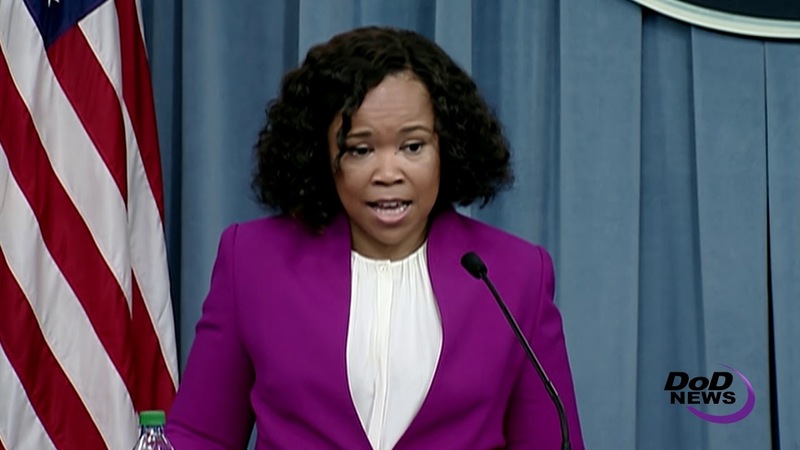 “The three facilities are – or more appropriately, were – the fundamental components of the regime’s chemical weapons warfare infrastructure,” McKenzie said. One target, the Barzah center, housed the regime’s research, development and production center for chemical and biological weapons. Photos taken after the strike show that where once three buildings stood, there is now nothing but rubble. Strikes also hit a chemical weapons storage facility and a chemical bunker facility. “We selected these targets carefully to minimize the risk to innocent civilians,” the general said. “We are still conducting a more detailed damage assessment, but initial indications are that we accomplished our military objectives without material interference. I would use three words to describe the operation: Precise, overwhelming and effective,” he said.